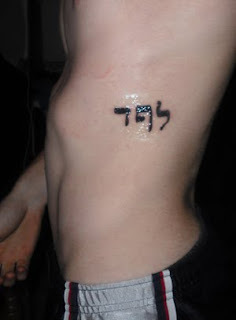 Good golly, you're right, that tattoo will be easy to fix! 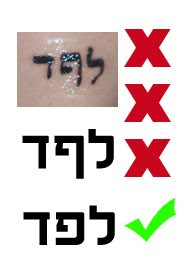 Also: because of the nikkud vowel system, when writing initials and acronyms in Hebrew, it is common (and advisable) to separate them with periods, or use a 'gershayim' (double inverted comma), in order to separate them from other words that would read the same. For instance, the IDF is written צ.ה.ל or צה"ל, and not צהל, in order to separate it from the word meaning 'rejoiced'. While these specific initials don't mean anything as a word, if I were to see it without any separation marks I would find myself wondering what 'lapad' is supposed to mean.